A number of issues are undermining engineering productivity. This eBook looks deeper at these issues and how Product Data Management solutions addresses them. What is MCAD?, What is Product Data Management (PDM)? This eBook is of most value to engineering leaders responsible for the performance of mechanical design teams. It’s no fault of their own, mind you. The product development process is getting more complex, as far- flung suppliers now supply key design contributions as well as components. Products are likewise becoming more complicated, as they include more electronics, software, and connectivity to the Internet of Things (IoT), and thus require more coordination between domain experts across disciplines. Regulations are growing both in number and complexity, forcing manufacturers to carefully follow procedures and document their compliance. The impact of these changes is tangible for engineers. Today, process complexity demands that each engineer tightly coordinate their work with customers, stakeholders in manufacturing, service, sourcing, and sales, and an ever- increasing number of suppliers. Increased product complexity means that no engineer designs a product, system, or a component alone. Instead, specialists in different engineering fields collaborate together as a team to make decisions. Regulatory compliance now demands that manufacturers institute more processes to mitigate legal and regulatory risk. It’s no surprise that engineers simply can’t get as much done as they could in the past. Their time is now splintered across a thousand tasks. However, some software providers have begun to take notice and make changes. A new wave of data management systems is emerging to provide the right capabilities for the task at hand. Applied correctly, organizations can use these systems to release designs at higher rates, boost the innovation of their products, avoid prototype failures, and resolve quality issues far earlier in development. Ultimately, the purpose of this eBook is to examine all of these issues. 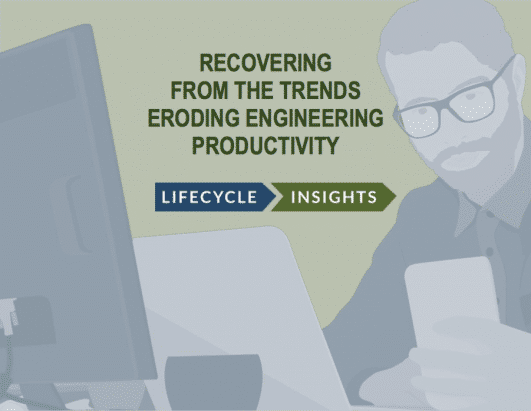 It delves headfirst into the topic by examining three trends that are eroding engineering’s productivity and technologies that counter those trends, with a focus on this new wave of Right- Sized Cloud-Based PDM. So, sit back and take it in. The erosion of engineering productivity isn’t as irreversible as you might think.